Since my earliest blog posts I’ve attempted to stress that trading lists, buying lists, using lists that fall off trucks is a bad email practice that’ll hurt your deliverability and decrease the effectiveness of your email list. We’ll to add onto that, it also hurts others. By being the one who gives list, you’re setting up other organizations to fail and decrease their effectiveness. All too often I see list swaps where the given list still has complaints, user unknowns, worthless emails. That’s a big reason NOT to do it and should be reason enough. But it also leads to an increase of complaints, which decrease deliverability. Here you can see the perfect example of how your actions may hurt others. 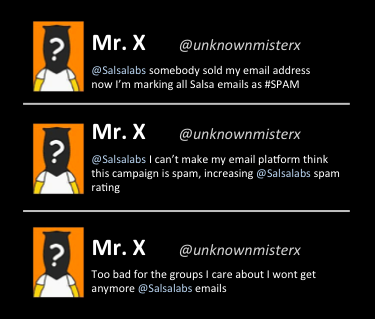 Many of Salsa’s Clients send their email blasts from a several pools of shared IPs. We do our best to ensure that one Client’s poor practices don’t negatively affect another, namely by segmenting these IP pools by how good client email practices are, but, the days when email service providers looked at individual IPs is over. Instead they look at the big picture and can overreact when confronted with situations like these. This means that through this one organization’s actions, other folks at Salsa may no longer be able to reach this supporter, let alone hurting Salsa’s reputation with this individual’s ISP. It’s important to remember that no organization is an island, especially when it comes to emails. Your actions can and do affect others, and in this case, may prove to hurt the cause. If for some reason you are so inclined to trade lists still….we’ve provided examples of what’s ideal and what to stay far away from. Previous Previous post: Subject: 0.1%, 1% and More Emails Going to Spam?